Bulgarian archaeologists have discovered a large bronze cross during excavations in an Early Christian basilica in the ancient city of Parthicopolis, which is located in today’s southwestern town of Sandanski. 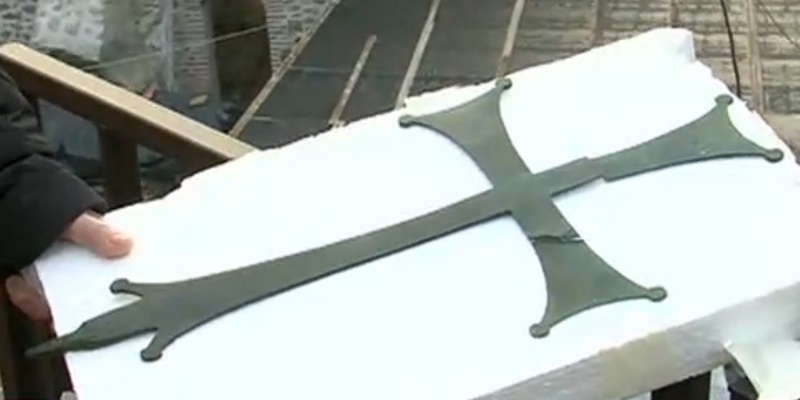 The find is unique because the cross is approximately 1500-years-old – it is dated back to the 5th-6th century AD – but also because of its size, reports Bulgarian TV channel News7. At 55 cm in length the Early Christian bronze cross discovered in one of the four ancient basilicas in Sandanski known as the Bishop Basilica is the largest of its kind to have ever been dug up in Bulgaria. The archaeologists conducting the excavations in the basilica in Sandanski, Southwest Bulgaria, have found two smaller bronze crosses as well. According to Vladimir Petkov, who is the director of the Sandanski Museum of Archaeology, the large bronze cross was used by the Early Christians of Parthicopolis – they would carry it at the front of religious processions. In his words, the ancient bronze cross from Parthicopolis is similar to smaller crosses found in past excavations in Serdica, the Ancient Thracian and Roman city that was the precursor of today’s Bulgarian capital Sofia, and in Thessaloniki, Greece; the unique form and inscriptions of the crosses found in Serdica, Thessaloniki, and now Parthicopolis is typical for the Thessaloniki Exarchate which was under the diocese of Rome until the 7th century AD. “We had found mosaics and murals on the walls. This discovery was a bit unexpected since we thought that back at the time when the basilica was destroyed by arson, the clerics had managed to rescue all of the movable objects such as the liturgical vessels that were used in the temple," explained Petkov, who first discovered the Bishop’s Basilica in the town of Sandanski during rescue excavations back in 1989. “The Bishop’s Basilica is one of the largest Early Christian historical monuments found in Bulgaria. It is located on a plot of 2.5 decares (0.62 acres), and includes a naos (the innermost chamber of the temple) where the liturgies were performed, baptisteries where people were baptized, and martyria where holy relics were preserved. And then we also found these movable objects. This was the procession cross that was used [by the Early Christians] here", he added. The discovery of the large bronze cross was made in 2014 as part of a EU funded project for the restoration of the Bishop’s Basilica, another basilica called Bishop John’s Basilica, and an Early CHristian complex; however, it has been made public only recently, with the finds having been studied thoroughly in the meantime. “This cross is fully made of bronze. It resembles the other [early Christian] crosses found and depicted in murals [in this part of the world]. It is very interesting because no cross of such proportions has ever been found in Bulgaria before. It is over 55 cm long and you can see the marks showing where it was stuck in the wooden pole so that people could carry it at the front of religious processions. It has engravings that are typical for a cross from this era, not unlike the crosses found in Serdica and Thessaloniki," elaborates the director of the Sandanski Museum of Archaeology. Petkov revealed his team had also unearthed smaller finds such as images of Chi Rho, one of the earliest forms of christogram, inscribed on stone plates with older inscriptions such as a Roman imperial inscription and a Roman poster for gladiator fights. “These were common cultural representations in the late Antiquity – from the Roman Empire in the 1st-3rd century AD continuing with the spread of Christianity up until the 5th-6th century AD," said Petkov, referring to the characteristics of his team’s discoveries. The TV report also featured a ceramic representation of a satyr, a deity in Greek mythology which was depicted as part human, part horse or goat, which, too, was found during the excavations of the basilica in Sandanski. The archaeological excavations of the Bishop’s Basilica in Parthicopolis, Sandanski, are expected to be fully completed by the end of summer 2015. The newly found bronze cross and the other Early Christian finds will be put on display at the Sandanski Museum of Archaeology. Interestingly, the museum itself incorporates in situ one of the basilicas, which has been partly restored with funding from the EU. Parthicopolis was an Ancient Roman city located in the Roman province of Macedonia; its ruins can be found in the downtown of today’s Sandanski in Southwest Bulgaria. It is known to have been an important center of early Christianity, having been located just some 100 km away from the Ancient Greek town of Philippi where Apostle Paul established the first Christian community in Europe. A testimony for the significance of Parthicopolis as an Early Christian center is the fact that it was mentioned during the Nicaea Council. The town of Parthicopolis was destroyed in barbarian invasions, possibly by the Slavs who tried to capture Thessaloniki in the second half of the 6th century. The Bishop’s Basilica is the largest of four ancient basilicas found in Parthicopolis, today’s Sandanski in Southwest Bulgaria. It consists of an entire complex of early Christian buildings, and was the seat of a bishopric in the late Antiquity. It was first discovered in 1989 by Vladimir Petkov, then and current director of the Sandanski Museum of Archaeology, and has been excavated ever since. Towering at 16 m and with a length of 30 m and width of 22 m, the basilica is unique for its Early Christian mosaics and murals, including depictions of fish and birds. The Bishop’s Basilica must not be confused with Bishop John’s Basilica, which is also one of the four ancient basilicas in Parthicopolis in today’s Sandanski in Southwest Bulgaria. It is especially known for a mosaic inscription found in the center of its narthex stating that it was built by a “Bishop John"; hence, it has also become famous as Bishop John’s Basilica. In 2013, the Sandanski Municipality started the partial restoration of the two basilicas, the Bishop’s Basilica and Bishop John’s Basilica, and the Early Christian complex in Parthicopolis with an EU grant of BGN 6.1 million (app. EUR 3.1 million) under Operational Program “Regional Development". The basilicas and the adjacent buildings were destroyed by arson during barbarian invasions, possibly by the Slavs who tried to capture Thessaloniki in the second half of the 6th century. The Sandanski Museum of Archaeology was founded in 1936, and is one of the five archaeological museums in Bulgaria specializing in ancient archaeology. It is situated over the foundations of Bishop John’s Basilica. Its exhibits feature a unique collection of later Roman marble gravestones and tablets and Early Christian mosaics.